Greek crisis: Greece submits a three-year loan request to the eurozone's bailout fund. Pro-European Union protesters demonstrated in Athens, Greece in late June. 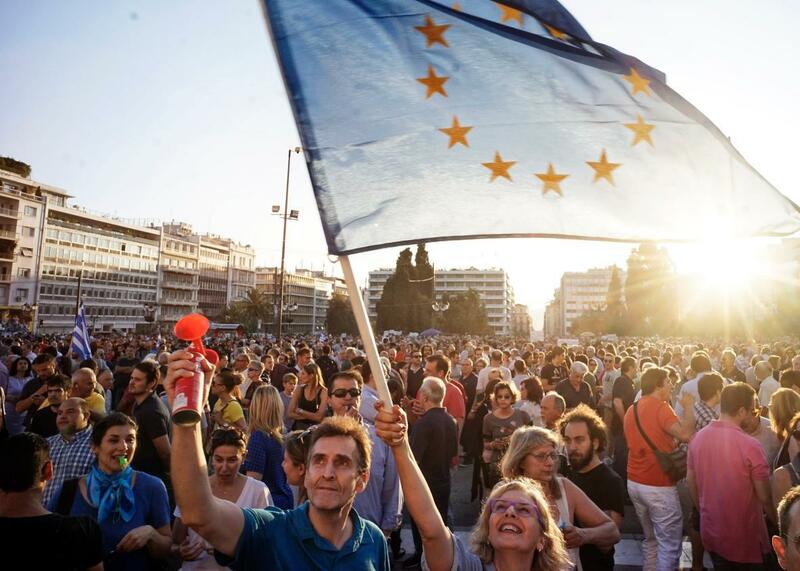 Thousands of people attended the rally in support of Greece remaining in the EU. In a last-ditch attempt to not be squeezed out of the eurozone, the beleaguered Greek government asked for a three-year loan on Wednesday. The loan is for an undisclosed amount, though some economists have speculated that Greece might need €50 billion ($55 billion) or more, and was requested from the eurozone’s bailout fund, the European Stability Mechanism. The request is the latest event in a long string of financially tumultuous moves the country has made in the past few weeks. While the French government has expressed hope for Greek salvation—French prime minister optimistically said Wednesday that a deal between the floundering country and its creditors is “within grasp”—other countries are not so positive. According to the New York Times, German chancellor Angela Merkel has indicated that she would oppose giving any additional money to Greece through the eurozone’s bailout fund until the country is able to scramble together a comprehensive overhaul plan that is acceptable to the rest of Europe. It’s unclear what economic changes Greece is willing to make in exchange for the loan it’s requested from the bailout fund, though it has gestured vaguely to plans about overhauling the country’s tax and pension systems. The Greek government will reveal more specifics about its request tomorrow.